The ideal time for cosmetic surgery is now through April, from facelifts to liposuction. Generally, the mindset is to get “work” done now to be ready for summer; the beach, bathing suits, summer parties, weddings, and vacation. The first of the year is a slow time for many and we’re still focused on that New Year’s resolution. Shake off "Old Man Winter" and reveal your inner Spring beauty! Many non-surgical treatments are popular to rejuvenate winter skin and remove bothersome hair. Don't forget to use products with plenty of sunscreen and moisturizer! Also, post-procedure it is best to stay out of direct strong sunlight. Body Contouring-Liposuction, abdominoplasty (tummy-tuck), etc. 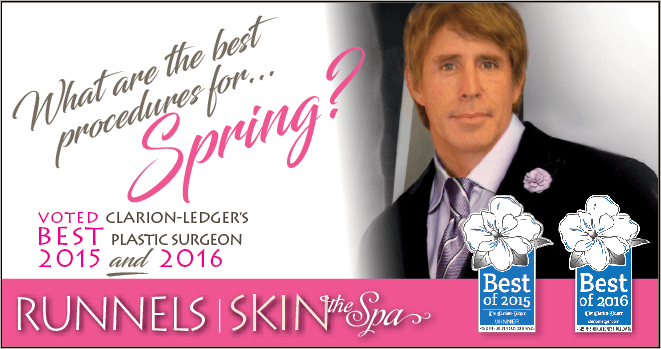 Voted Best Plastic Surgeon 2 years in a row by the Clarion-Ledger! Voted Best Cosmetic Surgeon 2 years in a row by JFP/Boom Jackson! Since 2005, Dr. Runnels is dedicated to offering the very best in expertise and experience, as well as clinical care, all under one roof! The Runnels Center and SKIN the Spa offer the best medical grade products and latest procedures, such as Everlasting Brows, Kybella, Volbella treatments, and more.